DJI remains one of the most recognizable names in tech, primarily for their drones, but their aerial devices make use of a very important aspect of photo and video – stabilization. For full size cameras, DJI has a slew of gimbal solutions, but last year they shrunk these products down to size for smartphones. The DJI Osmo Mobile has become the gimbal of choice for many smartphone-based content creators, but it definitely had a few annoying quirks and did not take into full consideration the next frontier of visual content: social media. DJI Mavic Air announced: the drone you were waiting for? Head over to our partner site Drone Rush for all the details on the new DJI Mavic Air. With the newest version of the Osmo Mobile, DJI has not only made the gimbal more accessible in terms of handling and even price, it has also updated what could be considered a niche device into something anyone can benefit from. This is the DJI Osmo Mobile 2 review. As a content creator, I got my hands on the original Osmo Mobile for smooth footage and further creativity after hitting the record button. With a little bit of work, DJI’s gimbal allowed for lovely timelapse footage and even hands-off video recording. That way, I would be able to get out in front of the camera rather than always being behind it. There were some issues in the design of the gimbal though. It was small enough to fit in a backpack and wasn’t difficult to maneuver in one hand for long periods of time, but mounting the Osmo to existing places like a tripod required a very specific part that screwed into the side of the handle. This was odd and cumbersome to do. In the Osmo Mobile 2, this is one of the first issues that is directly addressed – with a ¼ 20’ thread found in the bottom portion. This makes for much easier and more intuitive setups where users can just screw a plate on the bottom and securely stand the Osmo up. This does change the way the Osmo is charged and handled, however – DJI has now eliminated the need for battery packs. For better or worse, spare batteries are a thing of the past as the entire unit is now charged by the micro-USB port to the side of the control area. While a USB Type-C port would have been preferred, eliminating this part of the gimbal’s power features also made everything even lighter than before. Speaking of power features: there is a full USB port on the back that can power the mounted phone. That’s right, the 15-hour battery within the handle can be used as a power bank, which works in a pinch when your smartphone needs some juice to do stuff like livestreams. The updated Osmo Mobile 2 is light as a feather – this further benefits the handling experience and takes away the little bit of strain felt after long periods of usage. Some users might have preferred hot swapping batteries but the Osmo Mobile 2 can go for a long 15 hours – plenty of time for a super long recording or livestream. Unless you’re looking to use the gimbal for hours daily, it should last for several days between charges. But that mention of livestreaming brings us to the other big design change of the Osmo Mobile 2 – portrait mode. People might not generally be big fans of vertical video, but the fact remains that social media platforms like Instagram and Snapchat thrive on it. And DJI has outfitted this gimbal with a rotating clamp that can hold the phone upright for content that is meant for these platforms. Simply loosen the back portion of the clamp, rotate it accordingly, and portrait mode stabilization is achieved. This also answers the question of the Osmo Mobile 2’s usefulness when smartphone video stabilization is continuously improving. While true, OIS and EIS are features typically afforded to rear cameras, but not front-facing shooters. There is one big peeve I have here, however – the rotation of the clamp should have been designed to be done with the phone inside. Going from portrait mode to landscape requires users to remove the phone, rotate the plate clockwise 90 degrees and then mount it again so that the rear camera is not obstructed. The ability to rotate the plate counter-clockwise 90 degrees would have solved this issue easily and allowed the phone to remain mounted, even if rebalancing would still be needed. It honestly astounds me that the engineers at DJI didn’t seem to think that one through. Despite this extra step when moving between different orientations, changing the clamp to a spring loaded mechanism does help the balancing process. A fastener for the rear arm still needs to be used for horizon balancing, but smartphones can slide and adjust within the clamp if further adjustments have to be made. One just has to find the sweet spot for their own phone so that it remains steady when the gimbal is powered off. Once, found, power it up and the motor does the rest. Buttons and controls on the new stabilizer have seen a few changes, with the main difference being the removal of the trigger button. This took a bit of getting used to, as the trigger on the original Osmo Mobile was used to keep the phone locked on its current plane when needed. What used to be easily accessed by the index finger for locking the plane and resetting the horizon is now done by one’s thumb on the main button panel. Changing modes and tracking functions, then, is a bit less comfortable than before. Otherwise, the rest of the buttons and controls will feel familiar to any previous Osmo users. The joystick smoothly moves the gimbal on any axis and there is a zoom slider on the side. These controls work with the DJI Go app, which has improved significantly since the original Osmo Mobile. But unfortunately this is where DJI’s app makes or breaks the experience. I should mention that for this review, I have been using an unreleased beta version of the DJI GO app, though it is important to note that the Play Store updates show support for this new product already. So, although the promise of fully updated software is something to consider, DJI’s history of shoddy Android development still has to be mentioned. 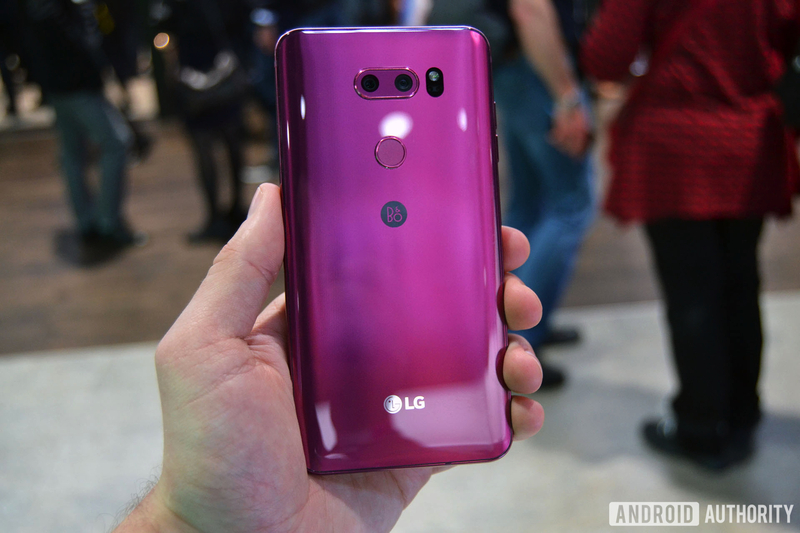 Back at CES, the app worked well enough for me to use it on the show floor and around Downtown Vegas, but during the filming of this review the app would either crash when opening up the camera or simply not connect at all to the gimbal. However, this is not an isolated incident – I own a Mavic Pro and have had the same issues on most Android phones aside from Samsung Galaxy devices. So, if you are not using the latest phones you might have a bit of a hard time getting the app to work consistently. Harsh as it might be, this is a reality that DJI/Android fans have wrestled with for some time now. It almost makes perfect sense why this gimbal is starting out as an Apple Store exclusive – there are a lot of kinks to work out with the Android side of things. When the app does work, it is very nice to use the physical controls to their fullest extent. As mentioned before, the M mode button is used to change the gimbal’s behavior – one press changes the horizon lock, two presses resets the gimbal position, and three presses changes which camera is being used. That last feature is one that only works with the DJI Go app, which is required for users to get the full experience. However, plenty of users will probably be happy to just use the gimbal as a stabilizer with some control via the joystick when using other apps like Snapchat or the built-in camera app. Snapchat is taking a step out of its walled garden with a new feature that will enable the sharing of Stories with other users outside of the main app. The DJI Go camera app affords a lot more control over exposure and color, which is nice – but the modes are really what opens up the creativity. The motors can move the phone around automatically for effortless panoramas, for example. ActiveTrack allows the user to set a point that the camera app and gimbal will continuously follow. This is on top of the Timelapse mode, which has the gimbal keep the phone steady as it stays put and records a scene’s movement over time. Or, you can put these two together for a Motionlapse or a Hyperlapse – whereby tracking keeps the camera trained on a subject while being moved around, marrying the aesthetic of a timelapse with dynamic movement. It’s important to note that users will have to be aware of the gimbal’s limits. ActiveTrack in particular gave us a few headaches as the gimbal occasionally went nuts on even slow moving subjects. We’ve been told this is getting fixed and refined in firmware updates leading up to its full retail release and shortly after. 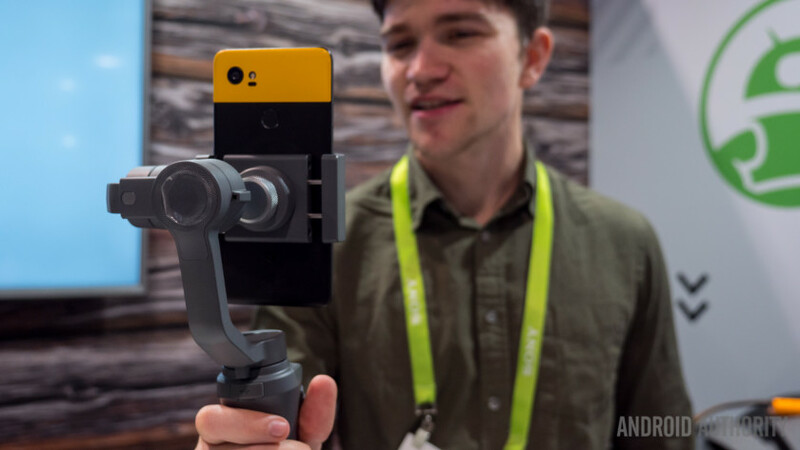 We also noticed that the gimbal could get pushed over the edge, quite literally – in portrait mode especially, a top heavy phone like the Pixel 2 XL would just keel over under the lack of strength in the motors. Remember to counteract any movements with corrections via the joystick. Despite some of its flaws and specific use case scenarios, plenty of people took to the original Osmo Mobile as a productive tool in one’s creative toolbox. If you’re a smartphone creative, you probably already have the original Osmo Mobile and if it works just fine, upgrading may not be necessary. The new edition builds upon the first by adding focus to today’s biggest video content platform – social media – despite maintaining its somewhat steep learning curve. But DJI’s greatest change in the Mobile 2 is in the price – at $129 (on pre-order now), this gimbal shifts from being a tool that made sense for prosumer creators to one that could benefit just about anyone. As DJI states, this device is made to “share your story.” DJI squarely targets new, perhaps young users who really want to step their social game up with the Osmo Mobile 2. Are you a user of the original Osmo Mobile? Does DJI’s new gimbal add to your social media game? Let us know what you think of the new edition in the comments below! What do you think about Zagg’s new screen protector for curved displays?